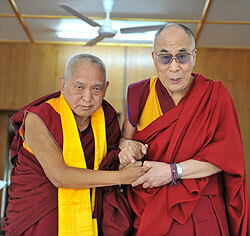 Lama Zopa Rinpoche met with His Holiness the Dalai Lama on May 9, 2012 in Dharamsala, India. The Benefit of Working for the Center – Wow! Sometimes people who are working at centers only think of the problems. Problems, problems, problems. Maybe it makes them feel sick. Their heart becomes very dry, very uninterested. [However,] if you know how to think, it’s really unbelievable. The highest merit is collected and there is the greatest purification by working for the center. Otherwise, you might think, “Oh, maybe I’ll go and work in the hospital, there’s much more merit from doing that.” You see, when you don’t think of Dharma, when you completely forget that the Dharma is the only way to really benefit sentient beings, to liberate them from suffering, then you start thinking things like, “Oh, maybe I’ll go and help in a children’s camp, that’s more beneficial.” People think like that. Thank you very, very much for working for the center, arranging facilities and so forth. The Dharma center is to benefit sentient beings, to free them from the oceans of samsaric suffering – all the sufferings – and bring them to enlightenment. So you working for the center means that. You are working for every single animal, even the ants you see on the road and the birds that fly in the sky. You are working for every one of them, from the tiniest insect that you can see only through a machine to the largest ones in the oceans like the whales. There are so many animals living in the depths of the oceans. There are big ones that eat so many small ones and many small ones that eat the big ones. You are working for every single cow and sheep, for all the animals, for them to achieve liberation from samsara and full enlightenment, as well as for every single hell being, every single hungry ghost, every single human being – not only in that state, not only in that country, but every single human being in the universe, in all the universes – and every single sura and asura being. You are working for everybody, EVERYBODY, to bring them to full enlightenment. 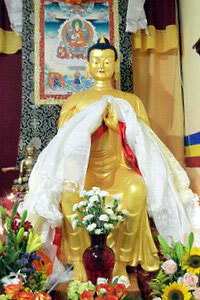 People come to the center to meditate on bodhichitta and to achieve enlightenment for sentient beings. You can’t imagine the benefit to everybody who comes to the center to do this, working to achieve enlightenment for sentient beings. So the work can be hard, but can you see the benefit? Can you imagine the benefit? Wow, wow, wow, wow, wow, wow! The benefit to every living being! Can you imagine the benefit of working for the center? For example, you work for the people coming to the center with the motivation of bodhichitta and they practice Dharma to benefit sentient beings. Can you imagine? Even by that? Wow, wow, wow, wow, wow. With much love and prayer from crazy Lama Zopa. Getting crazier every second, ha ha! Go to Rinpoche’s Advice page and to the Lama Yeshe Wisdom Archive for lots more advice from Lama Zopa Rinpoche. NB: Rinpoche’s amazing letter from the FPMT Annual Review 2011 is now available in Japanese! 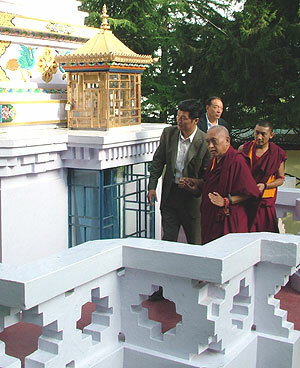 Lama Zopa Rinpoche introduces the Kalon Tripa (Tibetan Prime Minister) to Lama Yeshe’s stupa at Tushita Meditation Centre, India, May 2012. The Prime Minister and Minister for Religion and Cultural Affairs came to have tea with Rinpoche and discuss some projects that could be worked on together. Rinpoche is continuing to make progress with rehabilitation after manifesting a stroke in April 2011. As this is an ongoing, gradual process, please continue to dedicate for Rinpoche’s complete recovery and long life. Ven. Roger will kindly continue to send occasional updates, which will be posted on Rinpoche’s Health – Updates and Practices and sent out via the FPMT e-group (to subscribe to the FPMT Yahoo! Group, send a blank email to fpmt-subscribe@ yahoogroups.com). Go to Rinpoche’s Health – Updates and Practices for photos, more information and to subscribe to our RSS feed for updates. If you are inspired by Rinpoche’s compassionate contributions to the world, please join us on Saka Dawa, June 4, as we Work a Day for Rinpoche. Work a Day for Rinpoche is a fund that supports Rinpoche’s beneficial programs and projects. You can join in by dedicating your virtuous activities on Saka Dawa towards the realization of Lama Zopa Rinpoche’s compassionate wishes and donating your salary from that day to the fund. Lama Zopa Rinpoche with Dhakpa Rinpoche, Dehradun, India, April 2012. Sponsoring Yearly Initiations and Oral Transmissions: In April 2012, the Preserving the Lineage Fund sponsored initiations given by His Holiness the Sakya Trizin to many high lamas including Lama Zopa Rinpoche, Dhakpa Rinpoche, Dagri Rinpoche and others from the Sakya tradition, as well as many of the Sangha of the Sakya Monastery and Nunnery. This is the fifth year of a series of initiations given by His Holiness the Sakya Trizin at his monastery in Dehradun, India. This is a rare and utterly precious opportunity to receive the entire collection of initiations from His Holiness the Sakya Trizin called Wangya Norbu Tangwa (Garlands of Jewels of Hundreds of Initiations). The Preserving the Lineage Fund offered breakfast, lunch and dinner to more than 800 Sangha (including about 65 Gelug lamas) attending these most critical initiations, as well sponsorship of His Holiness the Sakya Trizin’s household and attendants. An elaborate long life puja for His Holiness the Sakya Trizin is part of the event and offered at the end of the teachings by Lama Zopa Rinpoche. Preserving the Wangya Norbu Tangwa has become a matter of urgency as the lineage of the initiations had completely died out in the Gelug tradition. Initially, Rinpoche with other Gelug lamas, including Kirti Tsenshab Rinpoche, received the first half of these initiations from His Eminence Chobgye Trichen Rinpoche in 1991, but age and poor health stopped him from giving the transmissions in their entirety. As this world loses the last remaining lamas to be born and educated in Tibet, it is imperative that Tibetan Buddhism is preserved and passed on in an unbroken lineage to future lamas and students. FPMT is an organization devoted to preserving the Mahayana teachings and donating to the Preserving the Lineage Fund is a significant way to support this colossal effort. Lama Chöpa Tunes and Audio Guide is available as an MP3 download. These particular tunes are chanted according to Lama Zopa Rinpoche’s advice. Divided into convenient tracks according to each section of the text, this long-awaited practice companion is chanted by Ven. Thubten Dechen with the blessing of Lama Zopa Rinpoche to be made available for the general public. Practices of Namgyälma: Translations, Practices and Commentary by Lama Zopa Rinpoche is now available as an eBook. On the advice of Lama Zopa Rinpoche, FPMT Education Services has been managing the translation of many pilgrimage texts. Wutaishan, A Guide to the Most Sacred Five-Peaked Mountain of China, is now complete. News on its availability is forthcoming. At Institut Vajra Yogini, France, a ceremony was held at the start of the second Basic Program. Resident Basic Program teacher, Geshe Loden, handed out signed completion cards, as well as a beautiful tsa-tsa, to the students who completed the first program and final exam. The students hope to soon complete their retreat requirement and graduate. Some of them also re-enlisted for the second round! Maitreya statue at Khamlungpa Center, Mexico, April 2012. Visit Mandala‘s FPMT News Around the World online blog for stories of events and new developments taking place at FPMT centers worldwide. As part of our recent News Around the World coverage, we’ve been featuring the arrival at FPMT centers of the Maitreya Buddha statutes offered by Lama Zopa Rinpoche, including a special Maitreya Statue Photo Gallery. If there’s something cool or interesting going on at your center, Mandala wants to hear about it. You may find it posted on our blog! Email editor@fpmt.org with your news. “Like” us on Facebook and help The Foundation Store support Lama Zopa Rinpoche’s work to create a more peaceful and happier world. Facebook fans receive updates on our latest products and special promotions, and daily inspiring quotes from FPMT’s spiritual guides. Facebook fans will be automatically entered to win a dozen boxes of hand-made Tibetan incense to use throughout the year! Winner selected: July 15. Don’t miss your chance to win – join The Foundation Store on Facebook today. Become a Friend of FPMT and stay connected to all that FPMT has to offer including the FPMT Online Learning Center, Mandala Publications and many complimentary resources offered at the free FPMT Membership level. Photo by Ven. Roger Kunsang, India, April 2012. Please join Rinpoche in using the FPMT Handbook online! Please find the updated guideline on the Teacher Policy and Information page in the FPMT Affiliates Area. The FPMT Masters Program Materials web page has gone live. The page is accessible in the FPMT Affiliates Area under “Education Programs” and provides centers implementing the Masters Program with all available unpublished translations and study materials. The revised edition of the Master Program Guidelines is also posted there. Shantideva Meditation Center in New York, USA, which was founded in 2004, has successfully affiliated with FPMT and transitioned from study group to full FPMT center! We welcome Dharmakaya Study Group, a probationary center in Nevada, USA. Thubten Kunkyab Study Group in Uruguay has recently closed. We rejoice in their efforts! Institut Vajra Yogini, France will organize a second round of 108 nyung näs from November 17, 2012 to June 21, 2013. Lama Zopa Rinpoche is offering sponsorship for up to 10 people willing to do 100 nyung näs. The offer is available until the beginning of September 2012. Click here to listen to the talk which Osel gave at Istituto Lama Tzong Khapa, Italy on April 12, 2012. Jamyang Buddhist Centre, UK is looking for a new director; Chenrezig Institute, Australia is looking for a spiritual program coordinator; Milarepa Center, USA is looking for a center manager and caretaker; Ganden Do Ngag Shedrup Ling in Mongolia is looking for an English teacher; and Land of Calm Abiding, USA is looking for a volunteer handyperson.